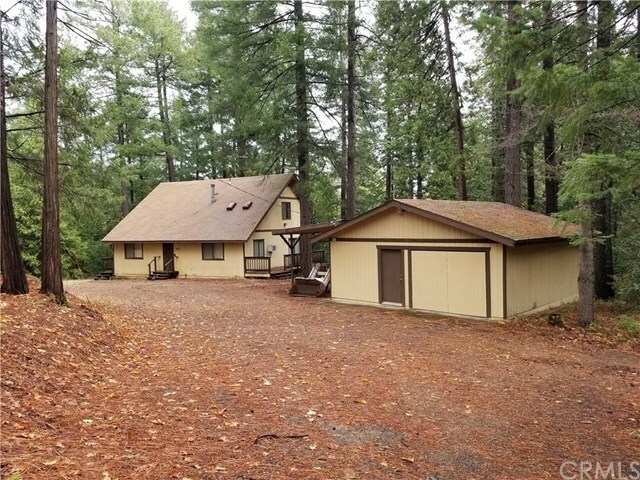 One Owner Semi Private Ranch Style Home on 3.81 Acres in the Pines with a Circular Driveway. Enjoy The Warmth From the Heater which is a Free Standing Wood Stove on a Brick Hearth. Tongue and Groove Knotty Pine Wood Vaulted Ceiling in Living Room with Skylights and a Ceiling Fan. Roomy Kitchen with Electric Range, Dishwasher, Microwave, Garden Window and a Sliding Glass Door. Oak Cabinetry throughout the Home. Six Inch Wall Construction Offers Lots of Insulation and there is Insulation in the Floor as well. 1 Year Old Water Heater. 10 Year old Composition Shingle Roof on the House and 15 Years old on the Garage. 1 Car Garage has a Separate Room with a Kitchenette and Bathroom. There is A Carport Attached to the Garage. 3 Bedroom Septic System. There is a Seasonal Creek For You To Enjoy As Well. The Village Market is within a few minutes of walking and they even have gasoline. NOTE: County Records show 4 bedroom but only has 3.